We began 2019 with a lot of uncertainty in the crypto markets. The prolonged bear market had taken its toll and sentiment was a mix of fear and frustration. But throughout this, there have been those who persevered, stuck around and continued to build. We’re not necessarily out of the woods just yet, and many would argue that the bear market is still with us, but here we are, at the end of Q1, looking forward to what’s still to come this year. Consolidation can be healthy. There’s been a shakeout during this bear market, but this has helped promote focus among those committed to blockchain and crypto. Sentiment is now improving and the cryptocurrency space is maturing faster than ever. We are humbled and grateful to play an integral role in the progression of this new and exciting space. This quarter has been a productive one for Liquid. There have been a lot of product improvements, new releases and important developments. Here’s what we did in Q1. As we pursue our vision of making financial services accessible for all, we continue to expand our teams to make Liquid a leading crypto exchange. We now have 340 staff from more than 20 countries working hard to make Liquid the best possible platform for you. Our team continues to grow, bringing a wealth of highly relevant experience from sectors like banking, finance and e-commerce. We made strides to increase our reach in China with the introduction of Traditional and Simplified Chinese on Liquid. Streamlining the cryptocurrency on-boarding process is a significant part of achieving financial inclusion. On February 21 we introduced debit and credit card funding. Liquid customers can now deposit EUR in minutes using a Visa or Mastercard. With EUR in your Liquid account you can buy cryptocurrencies like Bitcoin and Ethereum and use them to buy and trade any one of the more than 100 digital assets we have listed. Additional currencies are now in the works. This quarter we introduced our new and improved trading fee structure on Liquid, bringing to an end our promotional zero fees campaign. Our new structure means you pay just 0.05% for maker and taker when paying fees with QASH. If you opt to pay without QASH, the flat fee is 0.1%, twice as much. We believe that this approach makes us highly competitive in today’s market and further strengthens the utility of the QASH token. For high-volume traders who need the lowest fees possible to complement their activities, we launched a trading fee rebate campaign that pays out monthly in QASH based on trade volume. We started 2019 with bold ambitions for this quarter – to be bigger, better, faster. Liquid Infinity encapsulates that desire. Liquid Infinity brings in-demand Bitcoin CFD trading to the Liquid platform with up to 100x leverage. The professional dashboard gives traders a powerful set of tools for intricate control, comprehensive insight and deep discovery. Go long or short on our BTC/USD or BTC/JPY pairs and experience the full force of Liquid Infinity. Liquid Infinity is Bitcoin CFD trading with no expiry date. Just like margin trading on Liquid, you have a wide range of funding currencies to choose from: BTC, ETH, XRP, QASH, USD, JPY, EUR, SGD, AUD. Liquid Infinity sits alongside our traditional spot and margin trading features. If you have any questions about Liquid Infinity, please read our FAQ. We heard the calls from Liquid customers for faster withdrawals. If you have withdrawn BTC or ETH recently you will have noticed huge improvements in our withdrawal times. This is thanks to our integration of multi-party computing (MPC) technology with our withdrawal processes. Liquid has become the first exchange to successfully implement MPC technology in a live production setting. MPC is a well-researched area of cryptography that gives Liquid the tools to secure private keys and quickly process withdrawals at the same time. Liquid’s implementation of MPC technology has been extensively battle tested to ensure it lives up to expectations – which it does. We believe that the essence of cryptocurrency is that your money belongs to you – so you can access your crypto anytime and anywhere. To achieve this vision as a centralized exchange, we are aiming to push 10-minute withdrawals on Liquid. We have high expectations for QASH, but we know that the potential of the token is interlinked with the development of the Liquid platform. As we continue to roll out improvements and new features, the utility and appeal of QASH grows. But QASH needs an identity that resonates with our brand, our vision and our customers. That’s why, over the next few months, we are rebranding QASH to LQC, or Liquid Coin. 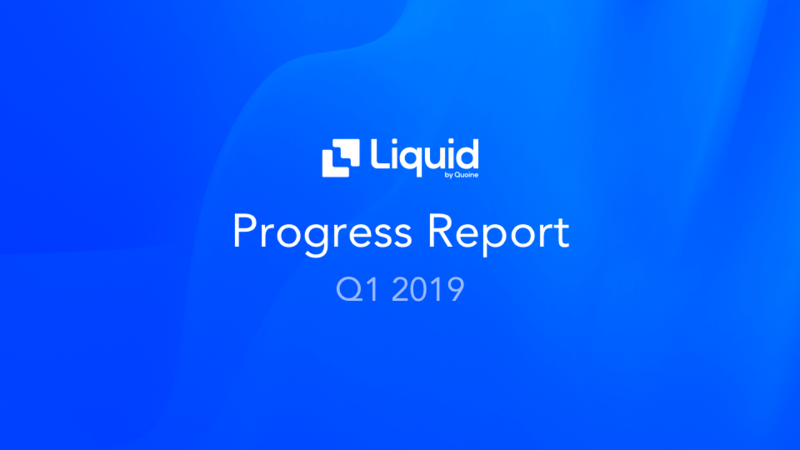 Announced this quarter, the rebrand will complement Liquid 2.0, the next phase of Liquid, which will introduce a new interface and new avenues of user experience. This quarter we listed three new tokens for trading: DREAM, HOT and HART. The Liquid Initial Exchange Offering (IEO) service continues to be popular for new token issuers. We hosted four IEOs this quarter: Game X Coin (GXC), Qcity (QCTN), Pledgecamp (PLG) and Thx! (THX). In an effort to maintain a robust trading environment and offer the best experience to our users, we began a delisting process for several currencies and related trading pairs associated with weak liquidity and trading volume. We believe this is in the best interest of our users and the health of the Liquid platform. To learn more about the token delisting process, along with which tokens are being delisted, use the help center. Over the last quarter we have been working full steam ahead on improving our product while the crypto market matures. But we made time to attend a small number of high-profile, key events and conferences to raise the profile of the Liquid brand. We hosted a meet up with Crypto.com in Hong Kong where Mike Kayamori was part of a discussion about the future of cryptocurrency with Crypto.com CEO Kris Marszalek. Mike also presented at the Asia Business Conclave in Hong Kong and received an award recognizing him as one of the Most Promising Business Leaders of Asia in 2019. Finally, Mike appeared on the "Crypto News" TV show in Japan, discussing cryptocurrency and the Liquid vision. As a company we continue to focus on improving customer experience and the customer journey through our platform. In the Customer Support team we have worked hard to reduce our reply time to well below the industry standard achieving an incredible 4 minutes and 30 seconds. But it's not just about speed. We want to look after you in the right way. Our Net Promoter Score (NPS) performance continued to achieve a positive level with a very respectable +31.4 in our latest survey with our global customers giving a 90% Customer Satisfaction rating. Despite our positive figures, we will never stop looking at ways to better ourselves. We believe each customer is unique and have been making our communications more personal and informative. Rather than just answer your questions, we take an interest in you, sharing relevant industry information, recognizing milestones and bringing you updates and enhancements to help you get the best out of your Liquid experience. We have also increased the size of our Quality Assurance team so that we can continue to develop our Customer Champions to deliver you the service you deserve. In addition, we continue to improve the overall experience of account verification and implement technology that create a smoother onboarding journey. The new Liquid Pro app is highly anticipated. Good news: The app looks great and it’s almost ready for full release. We can’t wait to show you all the great features we’ve packed into the app. This quarter, we released Liquid pro beta for a select group of Liquid customers to gather feedback and input before the public launch. We are now putting the finishing touches to Liquid Pro, getting ready for the big reveal. We are as motivated as ever to reach higher heights and exceed expectations. Many of you are interested in what we have in store for QASH. Every new improvement and feature added to Liquid is a potential turning point that can attract new users. As we push on into the year, user acquisition becomes a key focus. As Liquid grows, so does the audience of our token. By bringing more people into the Liquid ecosystem, we increase exposure to and demand for QASH. While we are pushing out these new and exciting changes, we haven’t forgotten our roots: our community.